The duration in Luxor can be amended, please enquire. Monday or Wednesday departures from Heathrow or Manchester, Newcastle, Glasgow or Edinburgh via Heathrow. 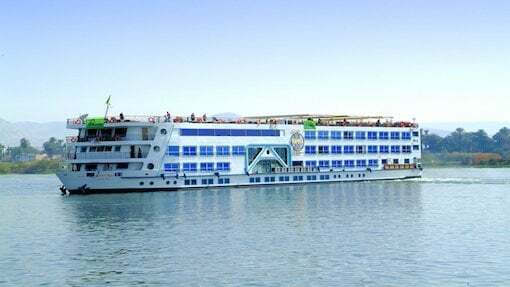 Choose from our luxury collection below of 5* Deluxe Nile cruise boats and hotels in Luxor. We can amend the duration in Luxor, please enquire. Luxor has often been called the worlds greatest open air museum, as indeed it is and much more. The number and preservation of the monuments in the Luxor area are unparalleled anywhere else in the world that know of. To say that the Luxor area is a major attraction for tourists in Egypt would be an understatement. It has been a tourist destination since the beginning of tourism. Even in ancient times, during the late Dynasties of the Greek and Roman periods, the area drew tourists, and has been doing so ever since. 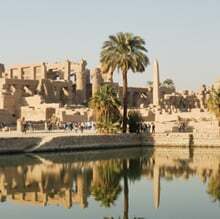 Today Luxor is well equipped to accommodate tourists with many hotels and in general a tourist industry ready and willing to serve the people from many countries that descend on this area of the Nile Valley every year. Luxor possesses undeniable charm. Here and there among the palace halls and gardens and on facades of nineteenth-century buildings with corbelled balconies there is a glimpse of the past and of a time of British colonials and Egyptian monarchs, of wealthy English, and of beys and pashas. As the sun sets, the Temple of Luxor, close to the large tourist souk, seems to stand apart from the world of the living. Its columns, colossal statues and bays recover their serenity, oblivious to the carriages passing by. On the other side of the Nile, the village of Gurna slumbers peacefully with its back to the mountain under stars shining more brightly than ever. Enjoy the fascinating sights and sounds of Luxor, stroll through the colourful streets of Luxor. A wide range of optional excursions available. Visit the Valley of the Kings and Queens, Tutankhamen's tomb, the Temple of Hatshepsut or take a felucca trip down the Nile.